NASHVILLE, Tenn. — After displaying nerves of steel and amazing skill, Jimmy Pollard, from Knoxville, Pa., was crowned champion in the Intermediate division at the recent Grand National Turkey Calling Championships in Nashville, Tenn.
By winning a title at the world's most prestigious contest, Pollard is the top caller in the world for his division, which is for youth ages 16 to 20. His father, Jim, is a four-time champion in the Senior division for callers ages 21 and up. 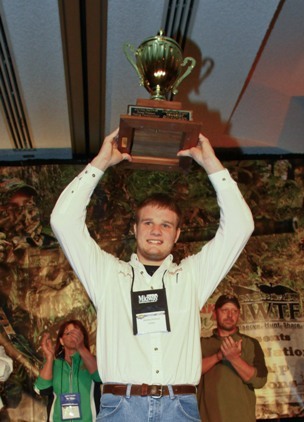 Jimmy Pollard, from Knoxville, Pa., was crowned champion in the Intermediate division at the recent Grand National Turkey Calling Championships in Nashville, Tenn.
"I'm 18 years old and I've been calling since I was five," said Pollard, who also won the Junior division in 2008. "Words can't even describe how I excited am. Turkey calling my whole world. I've been hunting with my dad since I was three and to be a Grand National Turkey Calling champion is the best." Each year, the National Wild Turkey Federation hosts the Grand National Turkey Calling Championships during the NWTF National Convention and Sport Show. Dozens of the world's best adult and youth turkey callers gather to test their skills in front of a panel of expert judges. This year, champions were crowned in 10 divisions at the 35th annual NWTF convention, which was sponsored by MidwayUSA and housed at the Opryland Resort and Convention Center. In the Intermediate division, callers imitate the yelps, cackles and clucks of a wild turkey hen. Overall, the winners from each division competed for their share of more than $25,000 in cash and prizes.